Take our personality test to understand yourself better. Live a more effective and fulfilling life. Your 20-page Personality Max report is personalized with insight to improve your relationships, career, learning and self. Join more than a million other people who have taken a Personality Max test since we launched in 2007. It only takes a few minutes to Get Your Report. We analyze 27 aspects of your personality including Personality Type, Multiple Intelligences, Learning Styles and Brain Hemispheres. It's true. Personality Max really is completely free. You don't need to create an account and we won't ask for your email address. Easy as pie. Carl Jung's theory of psychological types explains that each person is "wired" with different tendencies and preferences. Some of us are extraverted while others are introverted, some are "thinkers" while others are "feelers". Take the Personality Test to discover your Personality Type (plus a whole lot more) and read our articles to learn more about yourself. IQ tests are limited. In addition to being logical and "number smart" a person can also be "word smart", "people smart", "picture smart" and so on. Howard Gardner's theory of Multiple Intelligences suggests that we excel in different categories of intelligence. Use our test to identify your strengths. Learning Styles is a theory that suggests people learn better using different methods of learning. We perceive information using our senses. The three most practical senses in learning environments are sight, hearing and touch. The VAK model categorizes these sensory methods of learning as Visual (V), Auditory (A) and Kinesthetic (K) learning styles. 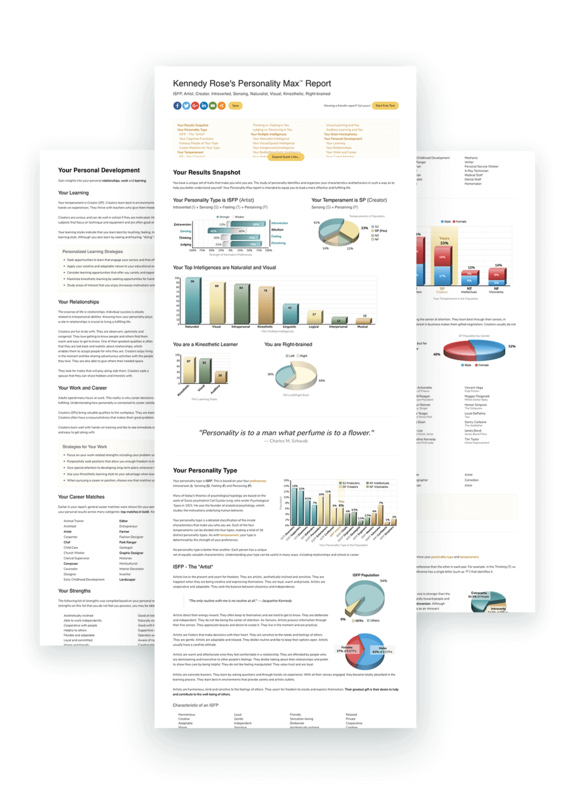 Your personalized report is 20 pages long with 36 detailed charts and graphs about you. Choose from Personality Type, Multiple Intelligences, Learning Styles and Brain Hemispheres. Your report includes strategies for your relationships, learning and work based on your results. We use your unique set of results to suggest a number of careers that could be ideal for you. You can view your report online or print off a hard copy. Share with friends or keep it private. The test and your report are entirely free. No need to register or give us your email address. It only takes a few minutes. No registration required. Discover and understand your different aspects by taking our free personality test. See your personalized report with comprehensive information on your personality type, multiple intelligences, learning styles and more.